Gloves used for light and precise work need to be supple, flexible and ergonomically sound. The Ejendals Tegera 90014 Ladies' Gardening Gloves are goatskin leather work gloves that provide a comfortable fit and exceptional fingertip sensitivity. 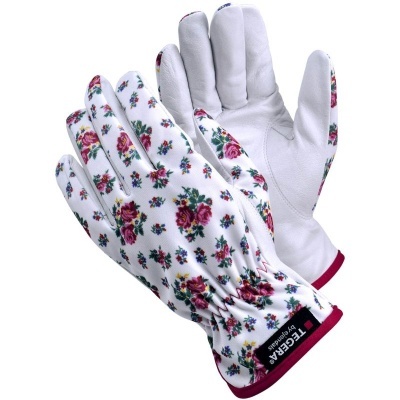 They are supplied in an attractive design with a rose pattern, and are ideal for gardening and shop work. The 90014 Light Work Gloves are designated Category I gloves, which makes them suitable for tasks with minimal risk of injury only. Most often this categories includes gardening gloves or similar where the chances of an injury are minimal. The Tegera 90014 Light Work Gloves are available in three sizes that should suit the hands of most users. Please measure the circumference of your hand around the knuckles (excluding the thumb) with your hand open and your fingers together, and the length of your hand from the tip of your middle finger to your wrist.